No wall? No ceiling? No problem! Peerless FPEPM Indoor/Outdoor Tilting Pedestal Mount provides an outstanding solution for placing displays where they truly stand out. Designed to work with Peerless-AV Enclosures for combining optimal placement with maximum protection, these all-weather pedestal mounts perform exceptionally indoors or out. Engineered to withstand the harshest outdoor conditions, they are constructed from corrosion resistant materials, e-coat primer and come with stainless steel hardware. No detail was left out of this pedestal mount, it provides incremental tilt to set the perfect viewing angle and a simplified Hook-And-Hang set up. Whether it’s used indoors or outdoors, for entertainment or digital signage, its one pedestal mount that stands strong. Due to solar loading, the enclosure should not be used in direct sunlight without a high temperature display or the display may go isotropic. 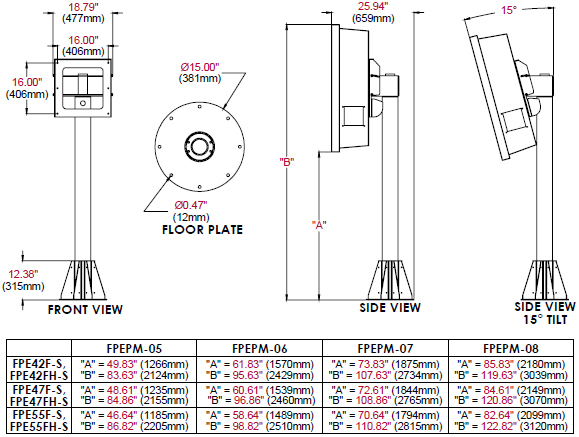 FPEPM-05: Box 1: 24" x 20" x11", Box 2: 65" x 18" x 16"
FPEPM-06: Box 1: 24" x 20" x11", Box 2: 65" x 18" x 16"
FPEPM-08: Box 1: 24" x 20" x11", Box 2: 89" x 18" x 16"
Weight FPEPM-05: 136lb (61kg). FPEPM-06: 146lb (66kg). FPEPM-08: 165lb (74kg). Shipping Dimensions FPEPM-05: Box 1: 24" x 20" x11", Box 2: 65" x 18" x 16". FPEPM-06: Box 1: 24" x 20" x11", Box 2: 65" x 18" x 16". FPEPM-08: Box 1: 24" x 20" x11", Box 2: 89" x 18" x 16". Shipping Weight FPEPM-05: 138lb (62kg). FPEPM-06: 148lb (67kg). FPEPM-08: 168lb (76kg). Monitor Size 40" to 55"